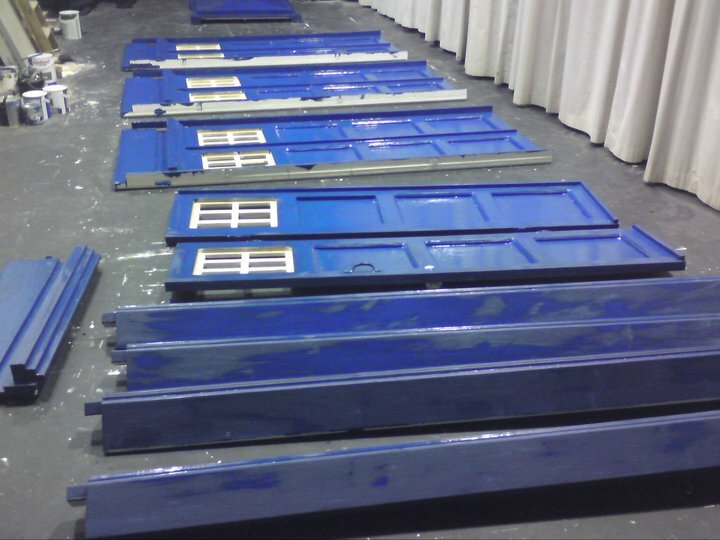 In this article Sam Rendell owned of the Tardis ‘Old Girl‘ tells us about why he decided to build a Tardis, yes it’s our first foray into ‘Prop-play’. The Toy department at House of Frazer in Bristol city centre, 2pm, July, 1982 was the moment at which the creation of ‘Old Girl’ began. Ever since the seven year old me first laid eyes upon a TARDIS play tent, the desire to one day have a TARDIS to call my own grew and grew. My parents were unable to buy me one and Santa failed me year upon year. So it seemed the only way to realize my Doctor Who dreams would be to build one myself. Another zip through time, Twenty-six years in fact, I’d been looking at the tardisbuilders.com website and found some detailed plans I could use. 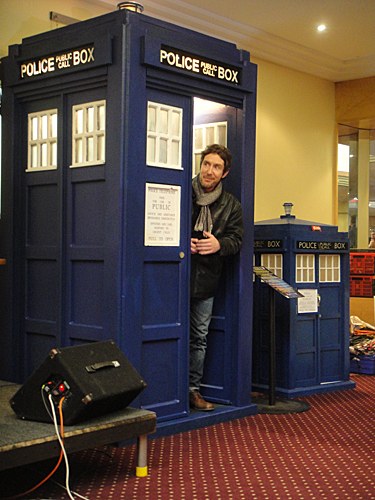 But then, after mooning over location pictures on the internet of the new Tennant Police box prop, the most amazing thing happened. I was working for a children’s literature festival in Bath, during which one of the events included a Doctor who evening (hosted by Nick Briggs) and a few props and set dressing on loan from the BBC. If I thought manhandling a genuine Dalek prop up the stairs of the guildhall was a buzz, it was as nothing to what followed. 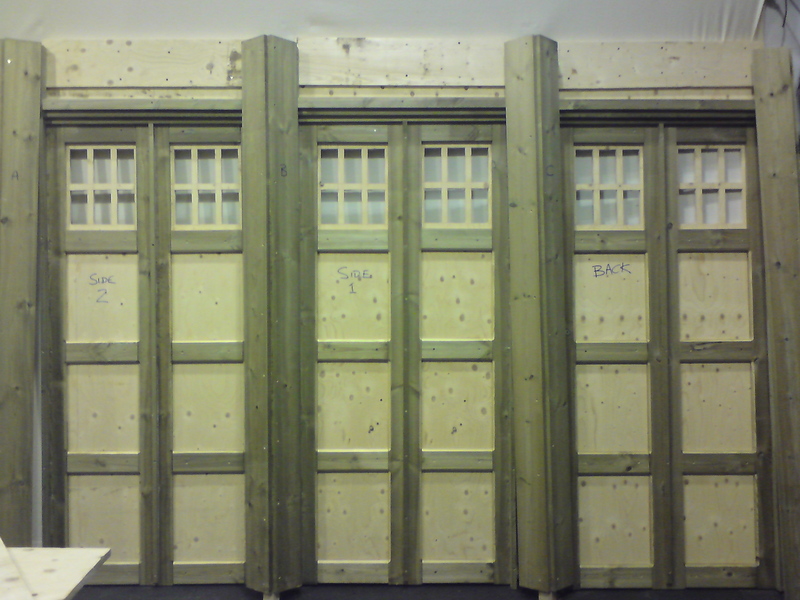 Waiting in an inconspicuous, white, Luton van were some very familiar looking pieces of blue timber. You might think that seeing how the REAL TARDIS prop was put together might destroy some of the magic. To learn that most of it was held together with gaffa tape could perhaps tarnish the mystery of the big blue box? Most certainly not larger on the inside. But for all the chipped paintwork, the screw-hole riddled interior and curses from the BBC crew, I simply couldn’t escape the excitement of realization that this was something I could build myself! OK, I did go to a theatre school. I KNOW how to build props and scenery, but somehow Doctor Who had always been exulted in my thoughts. Now however, I began to see how I might realise a long held desire. I had the knowledge, the research, the measurements and now, the excuse to begin construction! As the cast had to all enter from inside the machine, I decided I would make a flat-pack construction, enabling the director to decide where on the stage she wanted to set the box and remove the appropriate panel for the cast to enter unseen. The final dilemma was in deciding which version of the prop to build? I decided in the end that, as it was most likely there would be further changes as the show continued, I would honour the program by drawing from its roots. 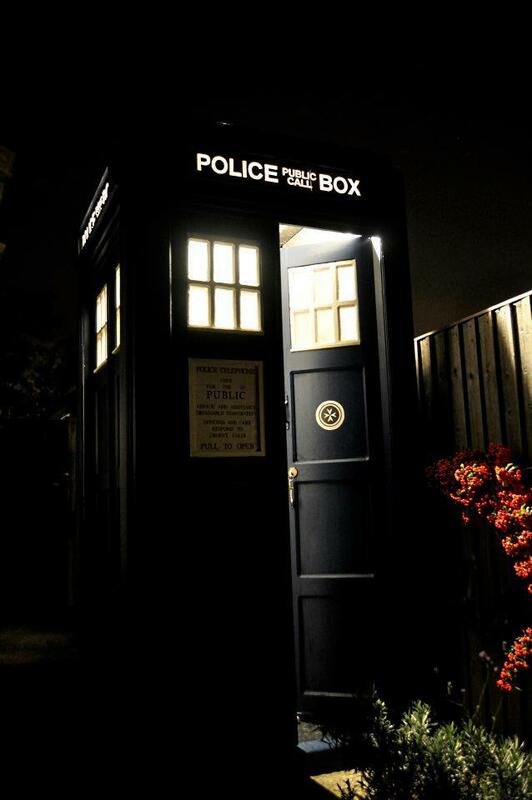 ‘Old Girl’ is based upon the police box seen in the pilot episode “An Unearthly Child”. She’s clean and unweathered, unlike most, and has one handle on her doors, lock on the LEFT hand side, as well as a white border around the “pull to open” sign. Construction took less time than I thought (a mere two months), however the sanding and finishing before any paint could be applied was not only labour intensive, but also hard for morale. Fortunately I had a willing team of volunteers in the form of the students of the school! ‘Old girl’ will be celebrating her third birthday this July (2014), but I still have the odd improvement or maintenance task to perform on her. If you were to ask how much it would cost to build a box of your own, I’d have to say I don’t know as I’m still spending money on her! So far the bill is in the region of £1,200, the greatest cost (unsurprisingly) has been timber. She’s been such a joy to me ever since I began. Having her in my life has made a strange, yet treasured contribution not only to the events she attends, but for morale in the workplace. Seeing her peeking out from the corner of my eye as I pass reminds me there’s an adventure waiting for me whenever I choose to take it!